It’s time to address the elephant in the room, Lionel Messi might never be able to reach Cristiano Ronaldo’s Champions League goal record. This has gone beyond comparing these two players, Lionel Messi and Cristiano Ronaldo are a gift to the world of football and they need to stop being compared. The latest Champions League Wednesday gave us a pretty good idea of the type of players they have both become, each of them has evolved into a very different animal. We are going to break their transition down for you, we are also going to tell you why Ronaldo may keep his goal record forever. The Portuguese forward won’t get Messi to reach his numbers anymore because Leo simply doesn’t feel the need, the Argentine has realized that he can be just as important for his club when he is playing a different position. During last Wednesday’s matches, Cristiano Ronaldo knew that he needed to make the expected appearance for Juventus vs Ajax because that’s why the Italian club brought him for. Without his presence, the Vecchia Signora wouldn’t have tied the game and they would have probably lost against the Dutch squad at Johan Cruyff Arena. Even though he didn’t have a chance to score another goal, nobody questions CR7’s importance on his team’s result from last night and every single Juventus fan knows how fortunate they are to have him on their side. Things are very different with Lionel Messi at FC Barcelona, the Argentine didn’t even score a goal against Manchester United but he was equally important during the match he played. 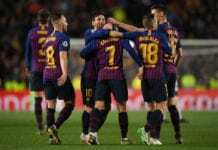 Messi is the player from whom the only goal of match originated, his contribution to Luis Suarez wouldn’t have brought the victory to his side. The Barcelona star is well aware of how much more he can provide to his teammates when he doesn’t score, which is why he doesn’t obsess with scoring goals like Cristiano Ronaldo still does. But as I said earlier, both players are just as important and as great as ever. The only difference between the two is that one has moved back to midfield a little bit on a more supporting role, and the other one has moved to the front where he has truly become the best goal-scorer of all time. There won’t be another striker who can do the things Cristiano Ronaldo does, with the same type of intuitive movements that he produces throughout the 90 minutes of any match. It took Cristiano only a single movement as he was gliding towards the box to understand what he needed to do in order to score that diving header, he is clinical in that way. The difference between the two players in regards to numbers has become abysmal, Ronaldo is the absolute king of Champions League knock-out stages when it comes to scoring goals. Starting from the tournament’s quarterfinals until the final in the tournament’s history according to WhoScored stats, Cristiano has scored a total of 41 goals during his career in this competition. After his number, we can see a large 25-goal gap before the next player even gets mentioned. You guessed who this forward is, Lionel Messi ranks second with 16 goals scored after this stage of the competition. We are talking about more than double the numbers Ronaldo has over Messi, this proves that the UEFA Champions League and Cristiano are a match made in heaven. We will never see another player as prepared to play this tournament as the Portuguese forward was since the day he scored his first goal, which happened exactly 10 years prior to his latest goal when Manchester United played AS Roma back in 2007. Cristiano Ronaldo has already scored 125 goals in this competition ever since. It’s been 12 years in the making to reach these stats that only a player like Kylian Mbappe could ever reach. But not Messi, and that’s okay. How would you describe Cristiano Ronaldo’s impressive numbers in the Champions League compared to Messi’s? Please share your opinion in the comment section down below.